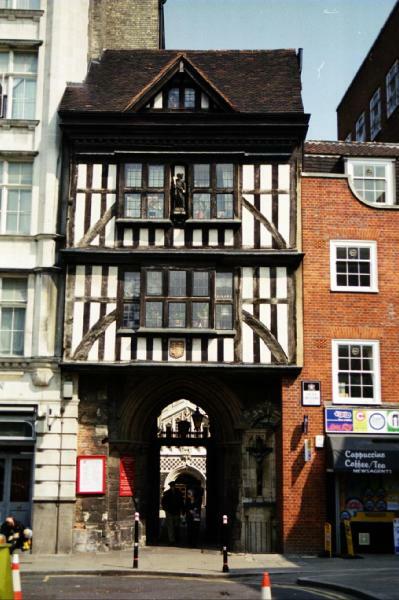 This fascinating fragment of old London is one of the earliest surviving timber framed facades in the city. It was the gatehouse to the Norman priory church of St Bartholomew-the-great. 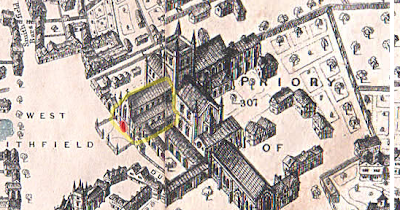 It was built atop the entrance to the south aisle of the nave of St Bartholomew's after the dissolution of the monasteries when the nave was demolished (shown in yellow on image bottom). The gateway is the remains of the south aisle door (shown in red) with parts of the stone work dating to the thirteenth century. The timber framed building above was added by William Scudamore as a residence in 1595. The gatehouse is of a simple design with two stories, the second overhanging slightly and a small attic gable. The shield of the residence of the family is shown at the front just below the first floor windows and at the rear. 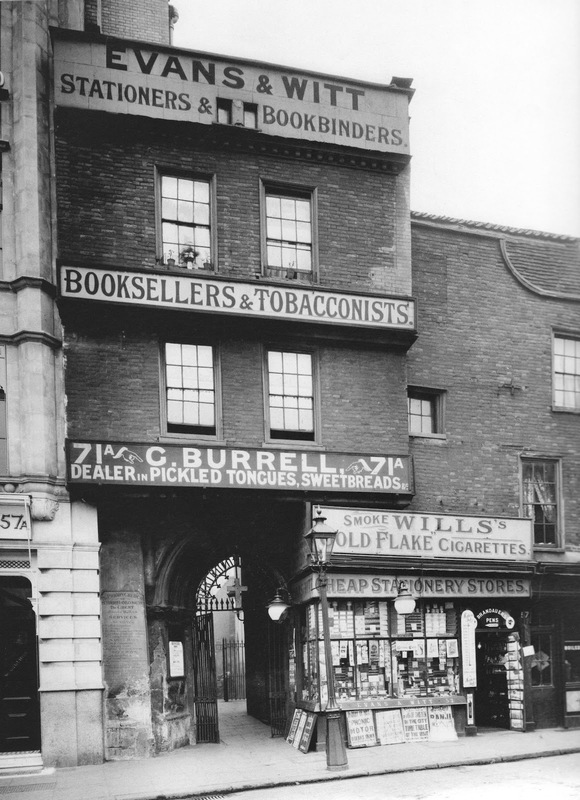 Until 1916 this gem was obscured by a polite Georgian front, the old Elizabethan facade was only discovered when damage was sustained from a nearby German Zeppelin raid during World War One. After the war in 1932 the building was repaired and its old timber facade restored. Today it is photographed countless times by tourists before they visit the church of St Bartholomew which is just through the gateway. The sculptor William Silver Frith was heavily involved in the restoration of the building. He designing the war memorial to the right of the entrance arch in 1917 to honor those fallen and the wooden sculptor on the second floor between the windows. The gatehouse is listed by English Heritage as grade 2* due to the rare surviving original timber frame. It has served for many years as the rectory for the rector of St Bartholomew. In 1948 Phyllis Wallbank, the wife of the rector set up the gatehouse Montessori school, a independent school. It began in the living room of the building with only eight pupils, although it has now expanded to several hundred and has moved close to Victoria park. The image above © shows the old Georgian facade before the restoration. The image bottom © shows a sixteenth century map of the church of St Bartholomew. Lovely, lovely blog! 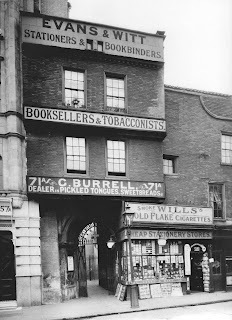 I used to work on the corner of Little Britain and Bartholomew Close and so all these posts about Barts and Cloth Fair have brought back wonderful memories. One of the main attractions of moving to London was its incredibly documented history, and blogs like yours make it easily accessible to aficionados like myself. Keep up the good work! Thank-you for feedback, walking around these historic streets to work everyday must have been a delight for you! Hi could you please tell me where the C16th map of the priory originated?